I’ll be honest, even though I was in my comic book sabbatical phase when Marvel fired up it’s Ultimate line of books, I was still aware of their existence and not terribly fond of the idea. The idea to reboot your setting by creating a new line of titles that exist in their own continuity, while at the same time maintaining the books in your existing continuity, just seemed like one of those bad ideas that are unique to the comic book medium. Then again, having a dozen flavors of Batman and X-Men each month also strikes me as a bad thing, so it’s obvious I don’t think like a publisher. A few weeks back, for reasons I can’t quite fathom, I made the spontaneous decision to start reading the Ultimate line of comics. In it’s entirety. Well, at least in it’s entirety pre-Ultimatum, the event I’ve read described as the ‘reset of the reset’. I figured that would make for a pretty good initial goal. Prior to deciding to take the Ultimate plunge I had literally never read a single Ultimate book. I was going to go into this project fresh and totally ignorant about most things Ultimate (except the much advertised fate of Spider-Man, the spoilers of which were completely unavoidable if you’ve been around the comic world for the last few years). I chose to begin the journey with Ultimate Spider-Man as it was the title that launched the entire line, but soon afterward I came to the conclusion that I needed to find a reading order that provided some semblance of a chronology. 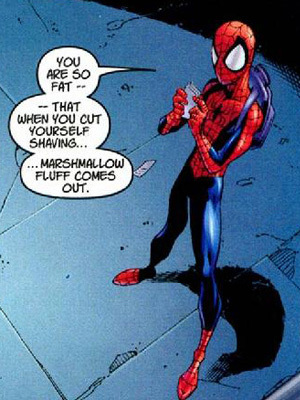 I’ll detail these reading order woes in Part 2, because prior to finding an answer to that problem I’d already started the Ultimate experience with the first two volumes of Ultimate Spider-Man. I don’t like his face. As far as the writing goes, Brian Michael Bendis‘s work in these two volumes is certainly never going to be described as ‘frantically paced’. The story plays out in a very slow and measured style, which I may have found maddening to read had I been collecting the book monthly during its release. When I think about it, though, I’m a huge fan of his current work on All New X-Men and Uncanny X-Men, and they share the slower storytelling style of the first 13 issues of USM. The story covered in the first 13 issues wasn’t exactly groundbreaking stuff. It was basically a variation on the Spider-Man origin story we all know, which was followed by Peter’s first experimental adventures as everyone’s favorite web-slinger. When it came to the characters, I found that I liked Mary Jane more than I typically do in the 616 books, but I was surprised they went with her learning Peter is Spider-Man so early in the story. I’m curious to see where they go with that. Also, I would like to take a moment to point out the fact that Uncle Ben’s ponytail somehow made his death even more tragic. I’m not exactly sure how this is possible, but I just call it as I see it. Hopefully Marvel see’s fit to produce an Uncle Ben’s Ponytail origin story at some point. Perhaps it could be a #0 issue. The villains introduced in these two volumes were relatively lackluster. Bendis‘s take on the Green Goblin is quite different, and I could see the character evolving into something fairly interesting, but his Electro is pretty lame. 616 Electro may be a guy in a goofy suit, but he’s still cooler than this scrub. And Kingpin, well…he’s Kingpin. Okay, that’s enough babbling for now. See you in Part 2, where I figure out what books I’m reading next and if Orson Scott Card can handle Iron Man.